Note: Please ensure to reference official EMC documentation before proceeding and ensure your system health checks are passed before completing a shutdown. 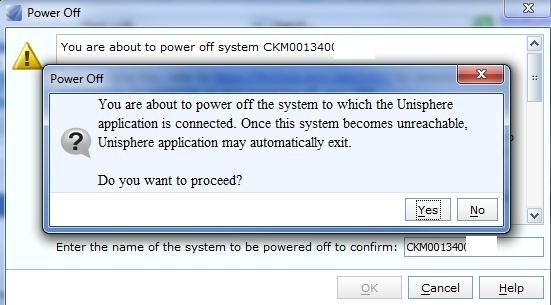 A new feature with the release of VNX Rockies(Block OE 5.33 & File OE 8.1) was the ability to Shutdown the Entire Array using either a single command or via the ‘Power Off’ button in the Unisphere GUI. This feature is also available for first generation VNX storage system’s, from VNX OE code release 05.32.000.5.209 & 7.1.74.5 onwards. These options are supported on Unified, Block and File systems. 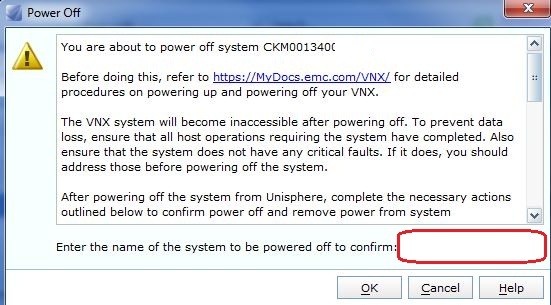 Thank you, could have used this already, as there is very little information out there in how to power down a VNX 5500 or 5300….. This is nice to know when you need to power down an array.